Although Oregon has been a run-oriented football team the past few years, the number of times they have run the ball has decreased in both of Mark Helfrich’s seasons as head coach. The difference in the Helfrich era thus far has been athletic passers playing the QB position rather than runners who can somewhat throw. The Chip Kelly-type QB will always be defined by Darron Thomas; a very smart and athletic player who could throw well enough to keep the defense honest. 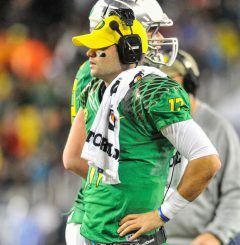 In contrast, Helfrich had arguably the best QB in Oregon history with Marcus Mariota, and going into his third year, he is likely to have another polished passer at the helm. Even though he was an extremely smart player, Darron Thomas lacked the talent to be great. Regardless who wins the QB competition between Jeff Lockie and Vernon Adams, Oregon will have a high quality passer running their offense next season. One doesn’t have to look any further than Oregon’s spring game to see just how good a passer Lockie has become. Completing a perfect 9-for-9 for 223 yards and 3 TDs, Lockie looked poised and took advantage of the bevy of talented receivers Oregon has at disposal. Lockie is a bit of a throwback vis a vis Thomas, being a very smart player who knows when to use his arm and when to use his legs. While Adams appears to be another in the Mariota mold, Lockie is apparently Thomas 2.0 — but faster and by all accounts, a better passer. His smarts aren’t just football IQ however, as Jon Solomon said in his article for CBS.com, “How smart is Lockie? He could have played at Harvard … (Lockie) didn’t try football until high school, when he decided to join his friends going out for the team.” In addition to his intelligence and QB abilities, Lockie has a categorical knowledge of the offense because he’s been a Duck for more than two seasons. After holding the clipboard for two seasons, is it finally time for Jeff Lockie to shine? Although Lockie was impressive, we won’t know if he can win the job until fall, when Adams gets to Eugene. Adams has much more game experience than Lockie, as he started the last three seasons at Eastern Washington. In those years, Adams won the Big Sky Offensive Player of Year award twice, and was twice runner-up for the Walter Payton Award – the FCS’s highest award for small college athletes. With 10,000 yards passing and 110 TDs under his belt, along with a nearly 65% completion percentage, it’s clear why so many fans are excited about Adams coming to Oregon. 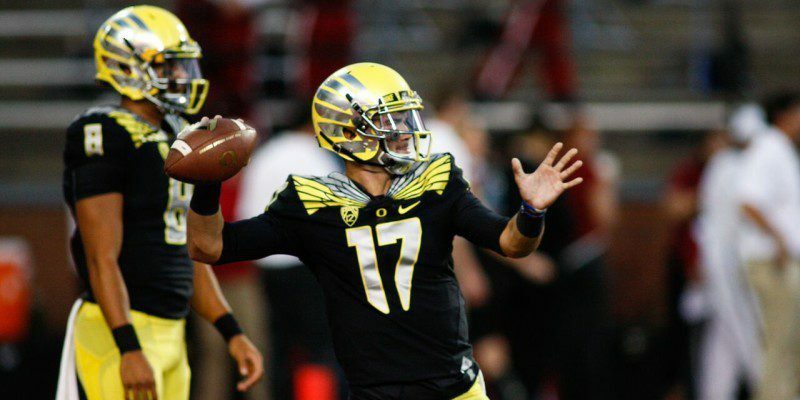 With either Lockie or Adams starting next season, Oregon will have a polished passer running the offense; and the exciting thing is, any halfway decent QB should be able to succeed with the players that Oregon has on their roster. 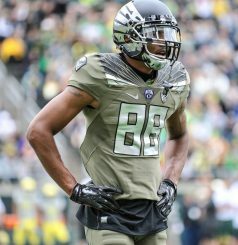 Only a year removed from having a receiving corps that looked like an Island of Misfit Toys, the Ducks have turned one of their weakest positions into their strongest and deepest. Better yet, every receiver has made their blocking a point of pride. Dwayne Stanford defines the type of ferocious blocker that Helfrich and Co. want to see. Even though Oregon has the players to have an amazing passing offense, they will not forget that the backbone of their offense will always be the run. As such, Oregon’s receivers had it drilled into them that blocking prowess equals playing time. When your workhorse power back is a threat in the passing game, you know your offense is going to be good. Along with a prolific passer at the QB position, and WRs who can burn a DB or knock him flat on his back, Oregon has versatile RBs who can make their presence felt in both the run and pass game. The obvious suspects for RBs who will be useful in the passing game are the small and fast Tony Brooks-James and the always explosive Thomas Tyner. Moreover, even Oregon’s resident workhorse, Royce Freeman, has shown the kind of soft hands that will make him a deadly asset on short passes out of the backfield. 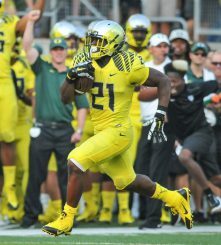 In years past, the Ducks have thrown the ball largely to open-up the run game, but as we saw last year, pairing a formidable aerial attack that can win games on its own, combined with Oregon’s deadly running game, is a recipe for success. This season, Helfrich will have the talent, versatility, and depth that will allow either Lockie or Adams to come in and continue the evolution of a very sophisticated air attack in Eugene. 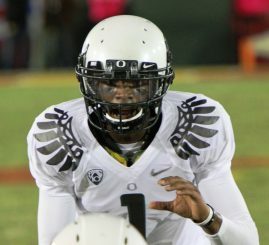 Regardless of how they do it, with the sheer talent on offense, this year looks to be a good year to be a Duck.